Are we now reaching the saturation point in TV ads? It’s possible that $45-50 million could be spent on the presidential race this week alone -- in August (!!! )… Romney campaign looking to turn page on a rough last seven weeks… Here’s one way it’s trying to achieve that: by announcing that Team Romney (campaign, RNC, victory fund) raised more than $100 million in July… Yesterday’s tragic shooting in Wisconsin… The Paul Ryan VP boomlet… GOP convention unveils a partial list of its speakers… Washington Post lands a punch on Plouffe… And the New Republic scrutinizes Stu Stevens. *** Reaching the saturation point: Last week, the campaigns, political parties, and outside interest groups spent almost $40 million in TV ads in the presidential contest, according to ad-spending data from SMG Delta. And this week, with the Americans for Prosperity $25 million buy for the next month (which breaks out to some $5 million per week), that number could very well jump up to $45 million or $50 million -- in August. And in just 8-12 battleground states. We often struggle to find the words to describe UNBELIEVABLE amounts of money being spent on this presidential race. But close to $50 million in a week is absolutely stunning. It’s also unchartered territory. Are there diminishing returns on this advertising? Do ads become less effective? How do you break through the clutter? We just don’t know. But here’s one thing we do know: At some point, no matter how much more water you put on a towel, it becomes harder to make it wetter. That’s why they call it saturation. 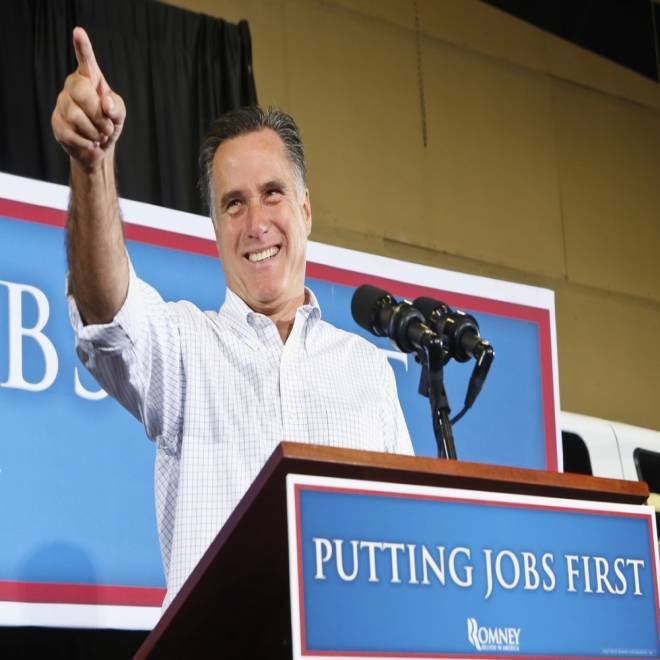 Republican presidential candidate Mitt Romney points to someone in the audience as he is greeted with cheers and applause at a campaign event held at Sierra Truck Body & Equipment, in North Las Vegas, Nevada, August 3, 2012. NBC's Mark Murray and Domenico Montanaro question whether the saturation point for campaign ads has been reached with spending this week alone nearing $50 million. *** Team Romney rakes in another $100 million in July: Here’s another way the Romney campaign is trying to turn the page: by releasing its fundraising numbers. Early this morning, it announced that Team Romney (so the campaign, the RNC, the victory fund) raised $101.3 million in July. It’s the second-straight month it has pulled in more than $100 million, though this is down slightly from the $106.1 million in June. By comparison, Team Obama raked in $70 million in June. But our normal caveat here: Do note that this $101.3 million isn't the amount raised by the Romney CAMPAIGN -- it's the total raised by all three entities (campaign, RNC, victory fund). Ditto the cash on hand. And as we continually find out when we see the actual numbers filed with the FEC, the Obama campaign outraises the Romney campaign in the apples-to-apples comparison. *** Yesterday’s tragic shooting in Wisconsin: It’s hard to ignore the second mass shooting in just over two weeks. Yesterday in Wisconsin a gunman opened fire at a Sikh temple, killing six and wounding others. Both Obama and Romney issued statements. “At this difficult time, the people of Oak Creek [WI] must know that the American people have them in our thoughts and prayers, and our hearts go out to the families and friends of those who were killed and wounded,” Obama said. “This was a senseless act of violence and a tragedy that should never befall any house of worship. Our hearts are with the victims, their families, and the entire Oak Creek Sikh community,” Romney added. *** The Paul Ryan boomlet: All of a sudden, there has been VP buzz surrounding House Budget Committee Chairman Paul Ryan (R-WI). Much of this is coming from conservatives who are still trying to get excited about Romney’s candidacy. (See the Weekly Standard’s Stephen Hayes and Bill Kristol.) And these are the same folks who have been pushing Marco Rubio, but who probably see the handwriting on the wall here. *** GOP convention unveils a list of its speakers: Last night, the Tampa Bay Times reported that seven Republicans -- Rick Scott, John McCain, Condoleezza Rice, Nikki Haley, Mike Huckabee, John Kasich and Susana Martinez -- will speak at the GOP convention. However, it’s very possible that none of these speakers will address in the primetime part of the convention, and the Tampa Bay Times notes that the RNC has yet released the day or time for these speeches. But here’s what we do know: If you were thinking there was an outside chance that Romney could pick Condi Rice or Susana Martinez as his VP running mate, this news pretty much eliminates that possibility. *** Landing a punch on Plouffe: Remember when we wrote late last week that Republicans were targeting high-profile members of the Obama campaign? Well, this news isn’t going to stop that. The Washington Post: “David Plouffe, a senior White House adviser who was President Obama’s 2008 campaign manager, accepted a $100,000 speaking fee in 2010 from an affiliate of a company doing business with Iran’s government. A subsidiary of MTN Group, a South Africa-based telecommunications company, paid Plouffe for two speeches he made in Nigeria in December 2010, about a month before he joined the White House staff.” But allies of Plouffe push back on this article, noting that folks like Colin Powell gave speeches to firms cited for financing ties to Iran before joining the Bush administration. What’s more, there doesn’t seem to be any kind of quid pro quo. Nevertheless, the article lands a punch on Plouffe. *** And profiling Stu Stevens: But Plouffe isn’t the only high-ranking adviser getting scrutiny. The New Republic profiles top Romney strategist Stuart Stevens. Among the revelations, Stevens told friends in 2008 -- including his book editor -- that he planned to vote for Obama in 2008. (Stevens says he didn’t vote for Obama.) It also notes that Stevens has written the screenplay for an HBO movie about how the New York Times uncovered Bush’s domestic-spying initiatives. And the New Republic reports that Stevens -- when working for McCain in ’07 -- urged the Arizona senator to hit Romney hard during that cycle’s GOP presidential primary. The McCain campaign didn’t think that strategy was good advice. *** On the trail: Obama raises money in Connecticut, while Romney is down… For the rest of the week, Obama stumps in Colorado on Wednesday and Thursday… And Romney hits Illinois and Iowa on Tuesday.